There have been many stories of survival come out of the April 27 tornadoes that devastated many communities in Arkansas. Towns like Vilonia and Mayflower are now left to pick up the pieces as neighborhoods were left shattered, causing a loss of both human and pet lives. Out of this tragedy there are a few miracles taking place with the pets misplaced. One such story is that of a dog found wandering Tuesday in Vilonia. As it turns out, this old guy is 15 years old. Now under the care of Fuzzy Hearts Rescue, he’s in a foster home due to his owner’s losing their home. The house was leveled, and the family had nowhere to go. Even though this sweet senior had difficulty walking with bad hips, plus being stressed out from the trauma, his family had feared he was killed by debris. They’re so relieved he’s safe, and being cared for until they can find a place where he can rejoin them. Animal Rescue Stories : A beloved dog who vanished during the huge firestorm which engulfed San Diego in 2007 has been reunited with his family. 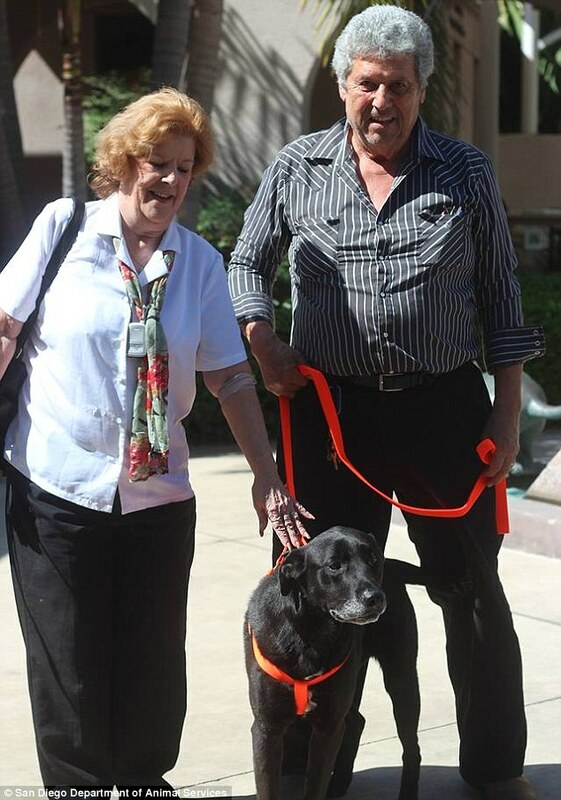 A beloved dog who vanished during the huge firestorm which engulfed San Diego in 2007 has been reunited with his family. John Hartman and his family not only lost their home during the firestorm but also their black Labrador retriever Buddy. Soon after the fires, someone found the two-year-old Lab and took him to a vet’s office but the dog escaped. The Hartmans moved to Oklahoma but never gave up on their beloved Buddy. However by an amazing stroke of luck, the Hartmans received a call from the Department of Animal Services during a recent trip to San Diego to see their son. Long-lost Buddy, now ten, had been found. The dog had been found running loose in the Imperial Beach neighborhood and was dropped off at Gaines Street Animal Shelter on March 28. Maizy was a young beagle when she followed the children of her family into the woods of Knoxville five-and-a-half-years ago, but she got lost that day – so very long ago for a dog. Somehow miracles do happen when luck and technology joined together to help Maizy and her long lost family find each on Tuesday reported wbir.com. The beagle stray was rescued by the Young Williams Animal Center in Knoxville, and as a routine practice, all pets are scanned for microchips. Not only did Maizy have a microchip, her information was current; in turn her owners Chad and April Helland were called with the good news. The Helland family had been distraught years before when Maizy lost her way. The friendly beagle who loved to cuddle was part of the family. Four-year-old Parker cried for his four-legged friend. Posters were displayed everywhere, but Maizy never came home. Eventually the family adopted another beagle named Cooper, but no one ever forgot their first dog. KNOXVILLE, Tenn. (WVLT) — The last time the Helland family saw their dog, their youngest son was four years old. Now he’s ten and the dog they never thought they’d see again is back home. “The day before we had taken a trip to Nashville. So the last thing that was on our minds was gee, I wonder if our dog that went missing six years ago is gonna come back,” says son Tyler Yonce. But finally it started to sink in that a family member was back. “My husband told me and I just broke down immediately. I thought I would never see her again,” says April Helland. “It was a whole range of emotions — shocked. I couldn’t believe it,” says her husband, Chad Helland. Monday, the family got a call from Young-Williams Animal Shelter telling them that someone found their beagle Maisy, the family pet that went missing back in 2008. “I spent many hours out in the woods. I took old t-shirts and put them out in the woods so I could leave my scent out there for her,” Chad says. Animal Rescue Stories : A Cle Elum couple has been reunited with their service dog, Lakota, five months after she disappeared from their home. The dog named Lakota disappeared from Ken and Barb Toczek’s home on Oct. 9.Ken is a disabled diabetic. A handler tracked the 4-year-old female Australian Shepard down Forest Service Road 3350 and determined she was picked up by a vehicle. The Toczeks hired an international K-9 search unit to look for the dog and posted a notice on Craigslist. Man who suffers from PTSD is threatened with jail and fines for posting flyers of his missing certified medical alert and therapy dog, Nanna. A Marysville man who suffers from post traumatic stress disorder says his service dog, Nanna, is missing. When police contacted him, he hoped for good news. Instead he was threatened with a citation, a fine, and possible jail time. Shawn Slater, 34, took a number of medications for his anxiety and seizures until he got Nanna. The 3-year-old Rottweiler is a certified medical alert and therapy dog. But just before the 4th of July, fireworks in the neighborhood frightened the dog. She forced her way through a hole in the fence and escaped. Even worse, she ripped off her dog tags in the process. Friends helped put up fliers through the city, but made the mistake of attaching them to utility poles and city property, which is illegal. That’s when someone from the police department called. “If I were to put another sign up, I will be getting a $250 fine and a day in jail per sign,” Slater said the caller told him.